Fortnite's Battle Pass offers players a chance to tier up, show off their hard work in-game, and earn sweet rewards doing exclusive special challenges to make the world of battle royale even more interesting. 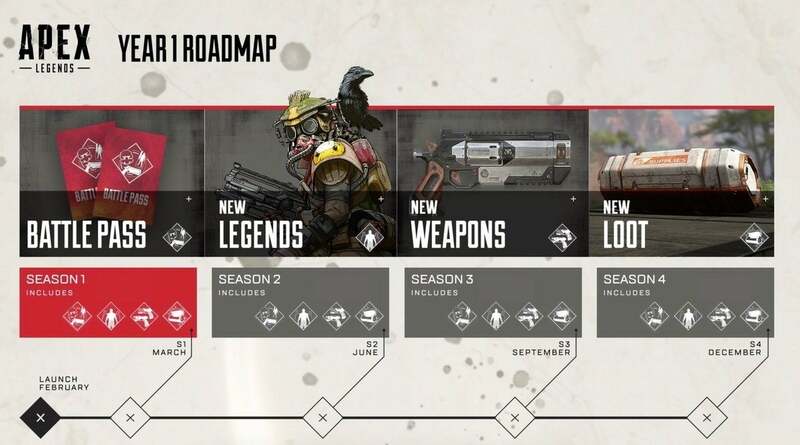 It looks like Apex Legends from Respawn is interested in doing something similar in March alongside a host of new content planned. So what does the Respawn version of the Battle Pass have to offer? Exclusive new loot such as banners, character voice lines, and unique skins for starters. This is pretty much a staple for any battle royale game, something that PUBG perfected back when it first crashed onto the scene, and Fortnite took it even further with a constant influx of new content. Just like other similar features, the Battle Pass will be purchasable - though we don't have an exact price as of yet. As for when it releases, the roadmap the team shared when the title first launched makes it seem like we'll be getting this additional option when "year one" kicks off at the beginning of next month. Season two will follow shortly after, with Season three slated for September and Season three set for December. With new weapons, new Legends, and new map additions - it looks like it's only to be the start of yet another wildly successful battle royale game, one that has broken onto the scene in a time when Fortnite and Call of Duty's Blackout reigns supreme. Since launch, the overall reaction to the latest free-to-play battle royale game to hit the market has been overwhelmingly positive. Still, other leaks have hinted at things like hoverbikes and titans coming to the game, and they all sound pretty freaking cool and it would be yet another way to keep the gameplay experience fresh! The developers have been very open about changes being on the horizon based upon player feedback and if they keep that transparency up, Apex Legends really could be a game with some serious staying power to rival that of Fortnite. Would you want to see Respawn Entertainment add into the world of Apex Legends? What other features do you think they should add that could make it even better? Sound off with your thoughts in the comment section below, or hit me up over on Twitter @DirtyEffinHippy!